What does this mean? I´m sure you have heard quotes like: “what comes around, goes around “or thoughts become things. Buddhists have a word for it and it´s called “Karma”. After looking into quantum physics and all kinds of spiritual wisdoms, I came to believe that everything is energy and that the energy we feel and express, attracts the same energy back. It´s not always in exactly the same way, but it´s the same energy, like, a magnet attracts metal. you are angry and start throwing things, screaming at people, even people who have nothing to do with your anger. You know the story, it´s not pretty, but it happens 🙂 Next you fall down the stairs and hurt your ankle, or you get hit by a car, or someone steals your wallet. To be honest I get into these situations too, but the more aware I become, the less it happens. Here and there I still lose it, especially when I´m tired and feel weak… it´s always interesting to watch the drama evolve. Meditation can be very effective, it gives you a second to make a choice, what you want to do next.. react or not react. That´s the most practical result of meditation. Right now Deepak Chopra offers a free 21 day meditation, which I totally enjoy. There are also great meditations offered by Jon Kabbat Zinn, Jack Kornfield and many other experts. Check a few and then you know which style you like best. Sometimes you might have changed your way and are trying to do the right things, but still…bad stuff happens. This might be a simple explanation: the so called “karmic wave” sometimes takes time and does not stop right when you are starting to do the “right things”. Yes, I know it´s frustrating, but with patience and a commitment to be a good person, everything will work out. What also helps is, to not take it personal. There is a beautiful, simple book by Don Miguel Ruiz, called the Four agreements, that helped me a lot. Let´s not focus on the negative aspect, but on the positive. If you feel loving and happy, you mostly attract good things to you. How this manifests in my life: Up until my fifties I was often stressed, because of difficult life circumstances. I was not very interested in spirituality, or personal development. My interests evolved around my family, my businesses and just having a “normal life”. When people roll their eyes at these words like: everything happens for a reason and Karma, I totally get it. But as my life crashed, my personality was so desperate for healing and escaping the pain that I was willing to look at other possibilities. Today I look back and know that, had I not left my marriage, I would not have learned to love myself and be ok with whatever is going on. I would have not ventured out of my comfort zone to learn new things and to be visible about them. It was my chance to find a creative, fun and courageous Marita. Somehow I got very interested in intuition, which in combination with meditation and awareness, helped me to experience amazing insights. The more aware I am, the more I understand that life evolves like a puzzle. First I had no clue how it fits, but eventually all the pieces work together. It´s never exactly what I planned… but I learned to be open to whatever appears, to listen to my intuition and act accordingly, by adjusting course. This is what I call my little, everyday miracles. It´s a life full of mysteries and I never get bored anymore. 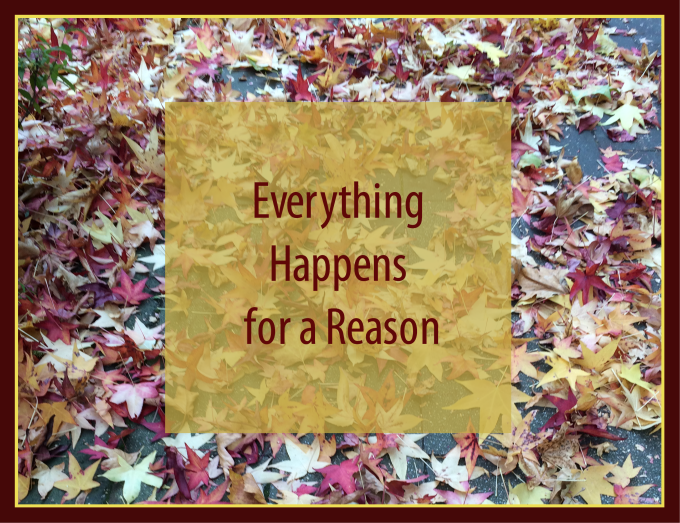 How do you experience everything happens for a reason? I always love to read your comments.